The publishers of the Georgia Crackers Song Folio No. 1 gave us some tidbits and details about the folks that made up the Georgia Crackers. 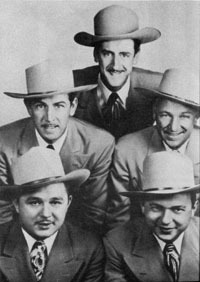 They were known as the group that put Hawkinsville, Georgia on the map. They got their start in music when they saved up some money from a good tobacco crop and got themselves a mail order guitar. The boys tossed a coin to see who would be the first to learn it. Hank, the oldest, won the toss and played the guitar ever since. He was said to be about 5 foot 4, with light sandy brown hair and blue eyes. In the middle of the brothers age wise was Slim, the 'matinee idol' of the group because he looked one of those movie cowboys. The youngest was Bob Newman. He sang lead and baritone depending on the harmony requirements for the song. He played the big bass fiddle. He was about 6 foot 2. He was the comedian of the group and did some impersonations and had a 'dead pan' act that always got to the crowds. They said the Newmans had been together for about 10 or 12 years, performing thoughout the midwest. 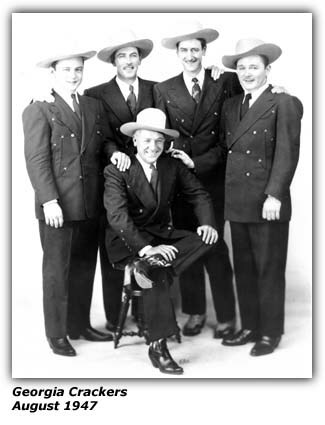 They were the oldest act on WHKC, a Mutual Affiliate in Ohio's capital. They could also brag of starting more rural and hillbilly programs on the Mutual Network than any other act. Winnie Waters was the youngest of the group, and hailed from Kentucky. He learned his fiddle the hard way - playing at the hoe-downs and corn-huskin' parties in his home town of Florence, Kentucky. Hal Snyder was born in Columbus, Ohio. He had been with the Georgia Crackers for about six years at that time. He played the Hawaiian and Spanish guitars, instruments he had learned as a kid.